As I explained in yesterday’s blog self care is vitally important all of the time, but especially when you’re grieving. In today’s blog, I will discuss the category of Eating and Drinking. When grieving, we may have no appetite or we may crave comfort from food. Even if we know we should make healthy food choices, sometimes the effort of buying and preparing a meal is more than we can muster. Many of us seek comfort from food. When we’re grieving, we may seek comfort from food to try to stay afloat in our sea of pain. Unfortunately, traditionally comforting foods are generally not healthy foods. For the first week or so after a death, if you need to take a break from eating healthy and indulge in some comfort through food, don’t criticize yourself for this choice. You may not want to eat at all. Loss of appetite is sometimes associated with shock and grief. But you need to eat. Therefore, don’t worry too much about WHAT you’re eating, just eat. Eat what you want. If that means you’re eating a lot of ice cream, mashed potatoes, and bacon, so be it. However, you don’t want to live in comfort food land forever because comfort foods are not only full of fat and sugar but these foods (because of the high sugar / carbohydrate content) may also lead to depressed moods. After the first week or so, limiting the comforting foods and focusing on more healthy choices is a way to help your body and mind feel in control. One of the most frustrating feelings after a loved one’s death is a feeling of powerlessness and a lack of control. By making healthy food choices, your sense of control regarding things that are appropriately within your control can give you strength. After the death of a loved one, especially a loved one for whom you were a caregiver, cooking may become especially challenging. Instead of cooking for two, you’re now cooking for one. Sometimes even the thought of trying to cook takes more effort than you can muster. So how can you break the cycle of eating comfort food when you’re not in the mood to cook or even shop for groceries? Grocery Store Delivery. Many grocery stores deliver. You can generally shop on-line and have your groceries delivered to your door. Look for ready-made meals such as pre-made salads and other nutritious choices. If you desire prepackaged frozen entrees, focus on brands and meals that are high in protein, low in carbohydrates and have a maximum of 300-400 calories per entree. If you don’t know where to start, look for meals that are labeled as “paleo” or “high protein”. Meal Delivery Services (You Prepare). 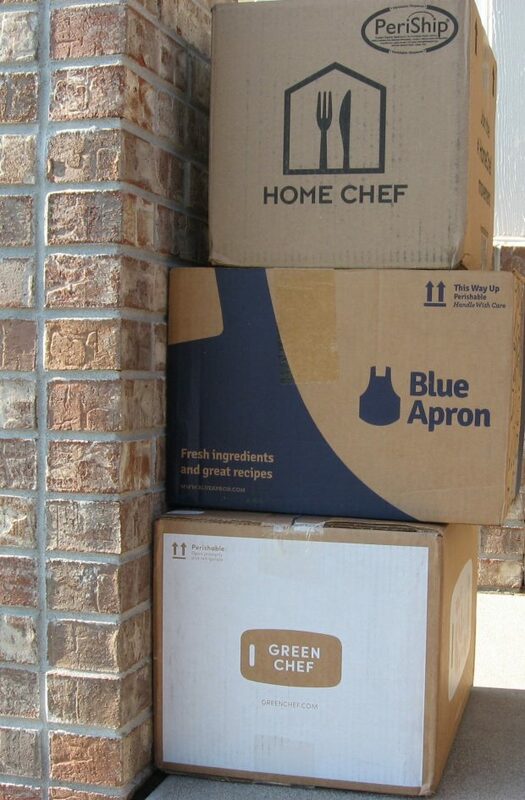 There are A LOT of options in the meal delivery service industry. You order meals that sound good to you on-line and then the ingredients are shipped to your door in a container filled with your fresh meat, vegetables, and a lot of ice packs. You then prepare and cook each meal in your own kitchen. Examples in this space include: Blue Apron, Green Chef, Hello Fresh, Home Chef, and Munchery (to name a few). Kent and I have found these services to be a lot of fun because we are able to try interesting and tasty entrees. These meal delivery services are also practical for us, because it forces me to cook when I’m not in the mood because the alternative to cooking is the food will go bad. There is a lot of competition in this space right now, so it’s easy to find coupons and special offers for new customers. Sometimes the offers are on the company websites, some of the meal delivery service companies offer special deals through marketing services like Groupon. As a loyal subscriber to these services, I can gift free food to a few people. I’m happy to share until my codes run out! Please contact me to request a code. Meal Delivery Services (Pre-Packaged). There are also meal delivery services that send prepackaged frozen meals to your door and all you need to do is warm in a microwave. There are a lot of examples in this space, but I haven’t tried any of them, so I can’t provide any brand suggestions. If this is of interest, search for “paleo delivery” or “frozen meals home delivery”. Restaurant Delivery. You can also have meals delivered from restaurants in your area, but it may be more difficult to find healthy alternatives. Try to focus on salads and lean meats when you’re selecting entrees for delivery. Healthy food will help you to feel better emotionally and to weather the grief storm without also having to deal with illness. Stay away from sugar and alcohol as much as possible. Lots of fresh water helps to flush out toxins—adding lemon (without a sweetener!) can help facilitate the process. When you’re grieving, you have a lot of emotional “toxic waste” that needs to be expelled. Work that lymphatic system by drinking lots and lots of water.